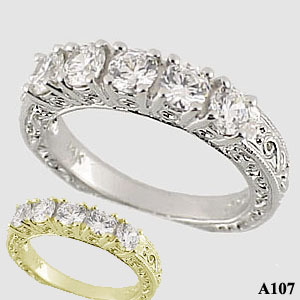 Stock #PLA107:This item is a Gorgeous Platinum Antique Style 5 Stone Wedding/Anniversary Ring. This piece features 5-.20ct Russian Cubic Zirconia stones Totaling 1ct (or blank, ready to set your stones). The item is Hand-Made in Solid 950 grade Platinum making it VERY heavy. Also available in 14k White Gold or 14k Yellow Gold.